Edible honeysuckle is a ripening culture, the fruits of which possess a pleasant taste and is rich in vitamins, pectins, sugars, mineral salts, bioactive substances. From the fruit of honeysuckle is cooked compotes, jams, preserves, jelly, the leaves are used to prepare medicinal infusions. Where to plant a plant? To grow honeysuckle, you first need to choose the right place. This shrub grows well in water-holding capacity, loam and sandy loam soils. If the soil in your yard zakislenna, before planting honeysuckle in it should be lime. If you want to get a good harvest of honeysuckle, plant it in the open area, as the shading effect on the development of this plant. 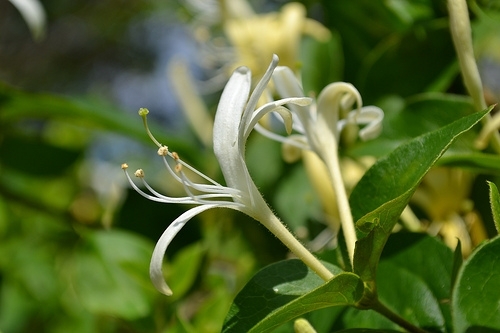 Can be planted honeysuckle under the protection of other larger shrubs and trees, but you need to make sure they are not shaded. For reproduction use of honeysuckle cuttings, cuttings and seeds. Harvested cuttings should be in the autumn, after the leaves fall. They should be stored in the basement or prikopat in the ground. To cut the cuttings should be of length 15 to 18 cm so that the upper section was located 1 cm above and 1 bottom, 5 cm below the buds. Planted cuttings should be in April, the soil should be well before that, paraglide and moisturize. When planting should ensure that the top Bud was covered with soil of 0.5-1 cm, and the distance between cuttings was 15 cm. Planted plants need regular watering, and weeding and loosen the soil on which they grow. A year later, the seedlings are dug and transplanted with a distance of 1 m.
To propagate honeysuckle cuttings early in the spring, not yet blossomed buds. For this last year's shoots bend and bolt to the soil. Autumn cuttings are dug and transplanted to the rearing. To grow honeysuckle seeds, they should be planted in mid-April, in the newly thawed soil. Seedlings will appear in about 2-3 weeks. They must be regularly watered and get rid of weeds. Every spring, during Bud break, shrubs should be fertilized with urea or ammonium nitrate. Every 2 years you need to make organic fertilizer, for example, a mixture of compost (10 kg), ash(200g) and double superphosphate (80g). Before Bud break, conduct renewal pruning honeysuckle. With removed boughs at a height of about 0.5 m. such pruning stimulates the awakening of a large number of dormant buds, which produce gains that give the crop the second year after pruning. Most often, the damage spider mite honeysuckle, and currants and this leafroller. To destroy them, the bushes are sprayed with a 0.2 % metafoam, immediately after harvest. At too high humidity on leaves of honeysuckle can form different spots – ramularia, Cercospora, in some cases there is powdery mildew. For the prevention and treatment of fungal diseases, honeysuckle in early spring sprayed with 0, 2% fundazolom, solution of copper sulphate. From mildew helps dusting of wood ashes, sulfur colloid and 0.5% soda ash solution.